Well, hello there. And who might you be? The transformation of our second bedroom from storage area to guest room to craft space to multi-functional space is nearing completion! The room update was in full swing this weekend with the arrival of our new pull out couch. An extremely generous wedding gift from Bob's mother, we found our solution to the guest bed loss at Domicile Furniture in early June and have been patiently waiting out that 10 week delivery time ever since. And as you can see, the boys were instantly smitten. Here's what we started with. Bob had inherited twin beds from a relative and these served very well in our previous apartment and for our first 6 months here. However, the amount of space they took up made the second bedroom a guest room and nothing more - it was definitely cramped and would have been hard to even work at the desk we had up against one wall. 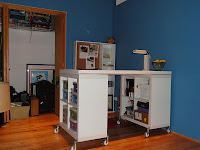 We said goodbye to the twin beds when we got to work on the craft table we built this spring. The room was now getting a lot of use, but without a bed option we weren't exactly catering to overnighters any longer. 1. 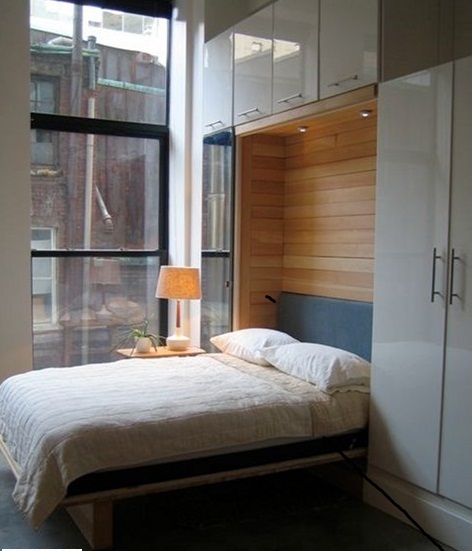 A Murphy Bed. Like this lovely one from this blog. 2. A Fancy Aerobed, just like in Skymall. 3. A Classy Lookin' Pull Out Couch. And here's why the pull out won out. This option allows for extra seating in the room at all times. Sturdier than an aerobed, and more flexible than a built in so we can take it with us to our next home (whereever and whenever that may be). The bed fits nicely against one wall, leaving plenty of space between it and the craft table. We picked up a new Damask Stripe duvet cover in cream for my full size down comforter and a set of blue gray sheets from Royal Velvet that complement the couch and wall colors from Bed, Bath and Beyond. 20% off coupons and a $50 gift card from my Bridal Shower? Bring on the savings. I added my feather bed to give the mattress a bit more cushion. After all, it is still a pull out couch and you do not want to wake up feeling a bar in your back! Lookin' good so far, but is something still missing? Oh yeah, how about the piles of prints we have been storing for months in the closet! Time to find these guys a home. We started with a set of 3 above the couch and our fourth travel print on the other side of the closet. A movie poster for "The Big Knife" - something I found on allposters.com about 6 or 7 years ago - hangs on the opposite wall from the couch. Instead of hanging it on its own in the middle of the wall, we positioned it closer to the craft table so it doesn't look like it is in limbo by its lonesome. This left a strip of space that I quickly filled with a few black and white 8x10's I have owned since college days. It might look a bit full now, but when you need craft room inspiration, who better to look to than Elvis, James and Audrey? Okay, now we're looking like a multi-functional room! Now who wants to come and stay the weekend?